Greater Shepparton City Council's 2019 Tourism and Major Events Calendar was launched today to over 100 tourism industry delegates. The major events calendar provides a great balance of activities across a full 12 months, covering a broad cross section of categories including arts and culture, food and wine, business, sporting and motoring events which reflect our region’s strengths, community interests and the great lifestyle our region offers. The year started with an events boom for the month of January and this has set the tone in what is expected to be the biggest events year in Greater Shepparton history, with a jammed packed calendar of events including a number of new events planned for 2019. Greater Shepparton City Council Mayor Kim O’Keeffe said the calendar had a strong focus on week long high participation events. “One of the biggest highlights on the calendar is the 2019 BMX Australia National Championships which will see over 1,800 individual competitors and 4,000 visitors across a nine day period from around the country generating an estimated $3.8 million in economic stimulation,” Cr O’Keeffe said. 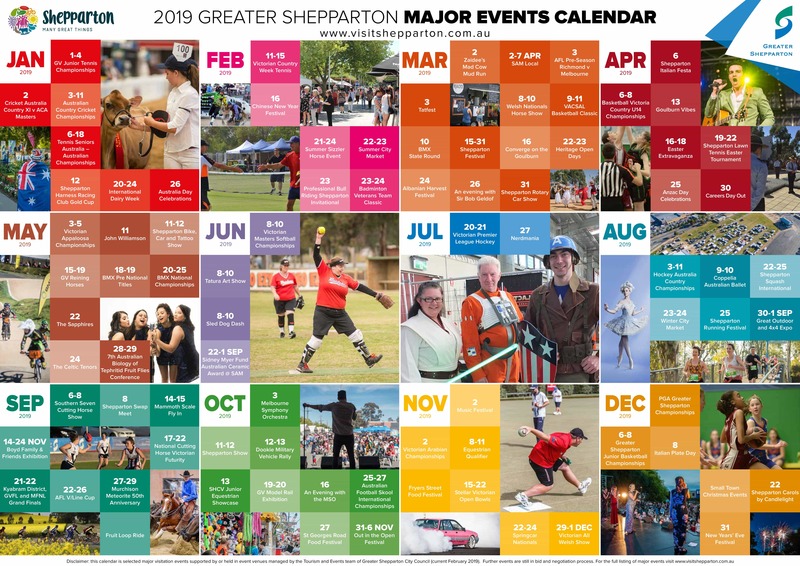 CLICK HERE to download your own 2019 Greater Shepparton City Council Major Events Calendar. Council is excited to see some these new events come to the region, such as the Victorian Country Week Tennis in February, Hockey Australia National Championships in August and the AFL V/Line Cup in September. Along with the week-long events, Greater Shepparton will also host a number of weekend events such as the JLT Community Series AFL Pre season match in March between Richmond and Melbourne with a crowd of up to 10,000 people expected, the under 14 Basketball Country Victoria Championships in April and the Victorian Softball Masters Championships in June. “We anticipate the calendar will generate between $40 and $50 million for the economy keeping local business busy and the economy strong across a number of sectors including accommodation, hospitality, retail and tourism,” Cr O’Keeffe said. The luncheon also provided updates on CBD events and activities, Great Things Happen Here tourism campaign, small business workshops, and the upcoming Shepparton Festival.